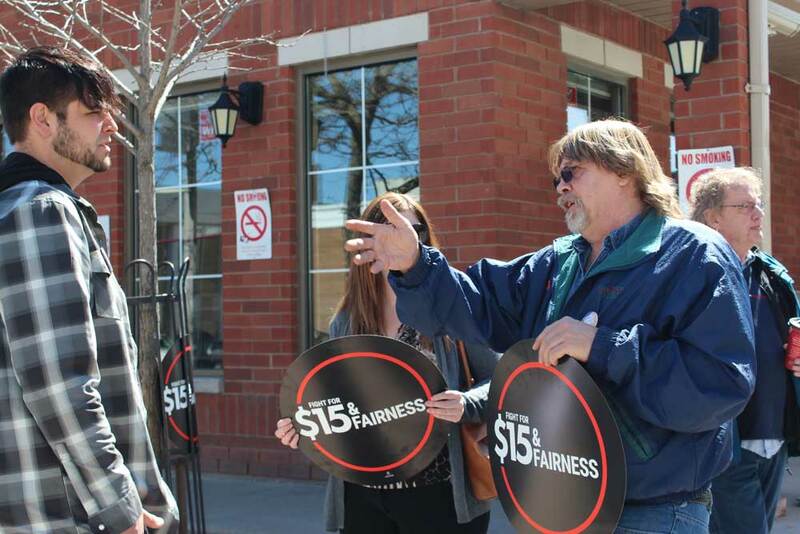 Jesse Cullen, left, and Jim Freeman, president of Durham Region Labour Council, at the Fight for $15 and Fairness campaign rally in front of Tim Hortons at 17 Athol St. W.
Would you like to sign a petition to raise minimum wage to $15 an hour? That is the question members of We Are Oshawa and Durham Region Labour Council were asking residents as part of their Fight for $15 and Fairness action. They gathered at the Tim Hortons at 17 recently to provide knowledge and gather support for the fight. Jim Freeman, president of Durham Region Labour Council, says things have to change when it comes to fair wages. Fight for $15 and Fairness is a North-American-wide movement for decent work and $15 minimum wage. On April 15, 200 cities took part in the movement. “As the cost of living is increasing…the only thing that isn’t going up is people’s wages, so we’re saying that to get up above the poverty line now you need $15 an hour just to basically survive,” he says. Currently the minimum wage in Ontario is $11 and the Liberal government has announced a 25-cent increase starting Oct. 1. “If you work 40 hours a week, you shouldn’t live in poverty. A 40-hour week should be lifting you out of poverty not keeping you in poverty, and $11 minimum wage is just keeping people in poverty forever. How do you get out of that if that’s all you can make?” he says.